But ‘Kite’ is certainly that – a good record. Aided and abetted by ex–Smiths guitarist Johnny Marr, Kirsty has put together a consistently attractive, bristling set of self–penned songs, full of jangly guitar and off–the–cuff vocals. Each number tells a story, sometimes autobiographical, often cinematic and fictitious. The tracks range from the poignant, motherly ‘Don’t Come The Cowboy With Me, Sonny Jim!’, which carries on the ‘Chip Shop’ tradition in silver–tongued style, to a beautiful ballad, ‘You And Me Baby’. A more expansive look appeared in NME courtesy of Steve Lamacq. Ten years on from her teenage debut, the erstwhile princess of New Wave pop is married to her prince Steve Lillywhite and a mother of two nursery school Michael Jackson fans. 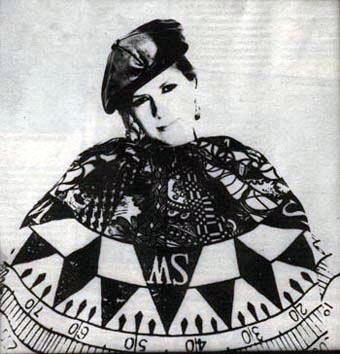 Kirsty MacColl, the impetuous girl who made the first ever Stiff Records picture disc is now your not so typical housewife. From the breathless, naive days with Stiff (“signing to Virgin was like joining the enemy”) through an unhappy spell with Polydor, which nonetheless produced her ‘Chip Shop’ hit, she’s bounced in and out of obscurity with the characteristic stoicism and delight of an earthy Londoner. Talking of Brian, Kirsty told Phil Sutcliffe (Q) that, at age six, hearing ‘Good Vibrations’ changed her life. “My brother had the single and to me it was, That’s it! I knew that that was what I wanted to do” Now, with a bold and characterful solo album, she threatens to move centre stage. She has hardly stepped on to a stage for eight years now because the last time she did, it scared her to death. “Doing a few gigs with The Pogues gave me the chance to get back into it without being the star who’s got their name up over the building. I still shake at the prospect but, God, nearly 10 years on, I should be able to deal with it. After having two kids you ought to be able to do anything. The hardest thing is reproducing my harmonies live. I’m interested in hearing from people who sound like me – asexual, deadpan, no bleeding all over the carpet. Boys or girls. It doesn’t matter as long as they’re not trying to do the big warm thing like Aretha. It’s more Hank Williams I aspire to, like cheese wire going through you. That would be brilliant. Always happiest in the studio though, recording the groundwork for ‘Kite’ in their home studio in Ealing was key. “Studios are usually enormous, womb–like places where you can’t tell whether it’s day or night. At home the studio has window, you can actually look out at real life.” They wrapped their day around the children’s needs and got stuck into the album from bedtime into the small hours. “It’s easy working together because he knows what I want and I know he knows and he knows I know he knows, although I must say when I do a session for him I always think I should be louder. But then, he’s responsible for the overall sound and I’m just listening to me, me, me. Given the choice I’d always want him to produce my records because I think he’s the best”. 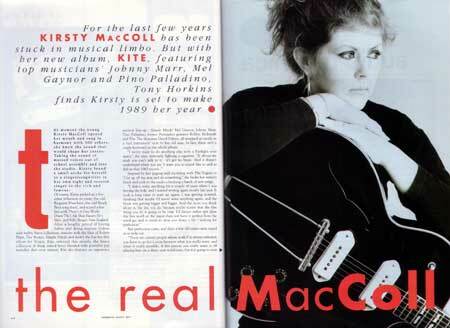 International Musician magazine carried a fine profile of Kirsty written by Tony Horkins, also in 1989. 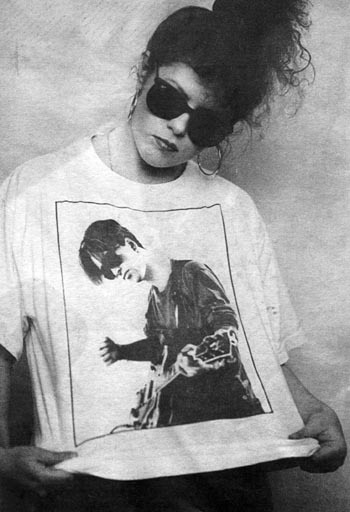 The moment the young Kirsty MacColl opened her mouth and sang in harmony with 300 others, she knew the sound that would shape her career. Taking the sound of massed voices out of school assembly and into the studio, Kirsty found a small niche for herself as a singer/songwriter in her own right and session singer to the rich and famous. Of course, Kirsty picked up a few other influences en route; the odd Requiem Mass here, the odd Beach Boys song there, and scored a few hits with ‘There’s A Guy Works Down The Chip Shop Swears He’s Elvis’ and Billy Bragg’s ‘New England’. After a lengthy period of having babies and doing sessions with the likes of Robert Plant, The Stones and Simple Minds she has her first album for Virgin, ‘Kite’, the finest collection of sharp witted lyrics blended with powerful pop melodies she’s ever written. It’s because there’s so many guitar players – sometimes four per track – that there was no room for any keyboards. Assuming the engineer’s still in his chair when the backing track’s recorded, then begins the creation of that vocal sound. “I can’t see why anyone in their right mind would ever want to do an interview,” she spits. “Except a journalist … ” … this appeared in Record Mirror.